I came across this Kale & Apple Salad with Pancetta and Candied Pecans on the Food & Wine website this week and it sounded really good; however, I thought the salad would be even better with figs, preferably fresh ones. The New York Times was raving about figs recently and my mom is always talking about them, since she has a fig tree in her front yard (although unfortunately it doesn't look like they'll ripen in time this year). I got lucky and found some fresh mission figs at Whole Foods recently, so I tossed them into my salad, along with some goat cheese, sautéed chicken and arugula, none of which were in the F&W salad, but I thought they would be good (hence the "inspired by" rather than "adapted from" credit below). I guess it's pretty obvious where I got the apple matchsticks and chives idea (see Little Bird review), although I've used them in a very different dish. Omit the chicken to make it vegetarian and the goat cheese to make it vegan. 1. Heat a small frying pan over medium-low heat. Toast the chopped pecans until fragrant and lightly browned. Set aside to cool. 2. Heat 2 tbsp. olive oil in a medium frying pan over medium heat. When hot, pat chicken cutlets dry and sauté until cooked through and browned, about 5-6 minutes per side (10-12 minutes total). Season with salt and pepper while cooking. Set aside and, when cool, cut into strips. 3. Whisk together the syrup, vinegar, 2 tbsp. extra-virgin olive oil and salt and pepper to taste in a small bowl. Add kale, arugula and pecans to a large bowl and toss with the dressing. 4. In a small bowl, toss the apple matchsticks with the snipped chives. 5. 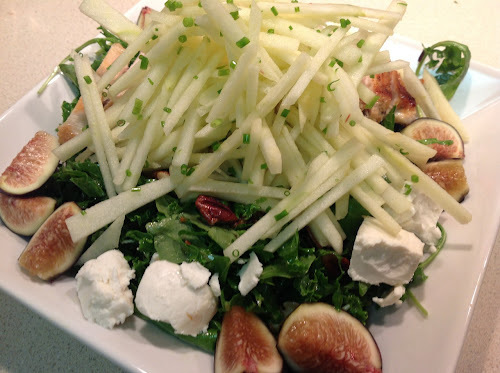 Serve the salad by plating the dressed greens first, topping them with chicken, figs and goat cheese, and then the apple-chive mixture on top. The figs were good -- and so was the goat cheese. Yum. Thanks. That was our first time having fresh figs at home. I think they have a pretty short season, since I usually don't see them at the market (super or farmers).